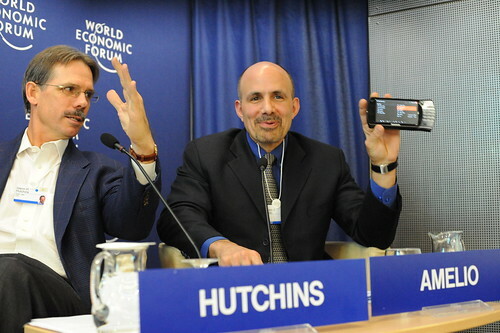 Lenovo CEO William Amelio, who above is holding one of its new MID computers during a presentation at the World Economic Forum in Davos, told me that Lenovo doesn’t have a headquarters. I think that’s brilliant. Why? Because I’ve watched at NEC and Microsoft and other big companies as people who aren’t at the headquarters get marginalized and forgotten. Worse, many times great ideas get shot down if they didn’t come from someone working at the headquarters. Amelio told me that they see great ideas come from everyone around the world, so why would they pick one place to have their headquarters? He works out of several offices and does lots of video conferencing. They’ve arranged Lenovo around several innovation hubs/research labs. Here’s a video I filmed of William at Davos last week where he talks about why they don’t have a headquarters and also shows off several of its new products, one of which won CNet’s “Best of Show” at CES two weeks ago. I hope to get to follow Amelio around soon to see this interesting company. Don’t know who Lenovo is? It’s a Chinese owned company that bought the Thinkpad line from IBM several years ago. They still make the best keyboard in the business and are sponsoring the Olympics in Beijing this year. 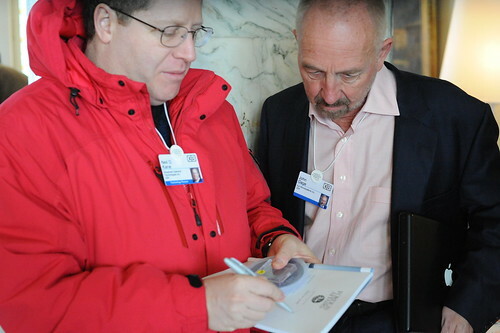 At Davos last week I met some remarkable technologists. But one guy who I had never heard of before had an interesting story: his firm turns methane gas into diamonds. Hence my sensationalistic headline of turning farts to diamonds (farts contain mostly methane gas). The guy is Neil Kane, President of Advanced Diamond Technologies, and that’s him above showing his diamond film that was deposited on a bed of silicon to Sun Microsystems’ lead researcher John Gage. On the bus ride home from Davos to Zurich he sat next to me and told me how the process works and just how useful it is. Turns out methane has one carbon atom and four hydrogen atoms. If you burn methane you’ll probably get a little soot, which is those carbon atoms showing up. But if you remove the oxygen, throw in a cocktail of a few other secret gasses, and heat it all up you can deposit those carbon items on a starter bed of diamond. Well, turns out that diamond has a few interesting properties. We all know it’s the hardest substance around, right? Well, I didn’t know that if you have diamond on two surfaces that it’s among the lowest friction coefficient around, too. Translation: if you coat bearing surfaces with diamond you’ll save energy and the bearings will last a lot longer. What else are they doing with it? Well, did you know your cell phone has several quartz crystals in it? Why? The crystals vibrate and keep the clock rates all synchronized. Diamond, he tells me, is even better than quartz for that use because it is more highly tunable and energy efficient and can be made to fit in a smaller space than quartz can. Anyway, it’s great to hear about good old American innovation that’s happening in the midwest (the company is located near Chicago).